Sharing her enjoyment of gluten-free life. Shirley has been gluten-free since she was diagnosed as gluten intolerant in 2003 and shares her belief that eating gluten-free can be easy on her popular blog – glutenfreeeasily.com. 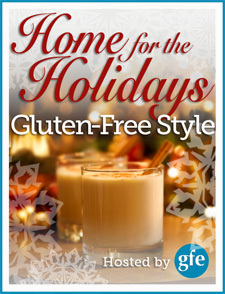 She’s currently hosting “Home for the Holidays, Gluten-Free Style” there with fabulous giveaways and mouthwatering recipes. 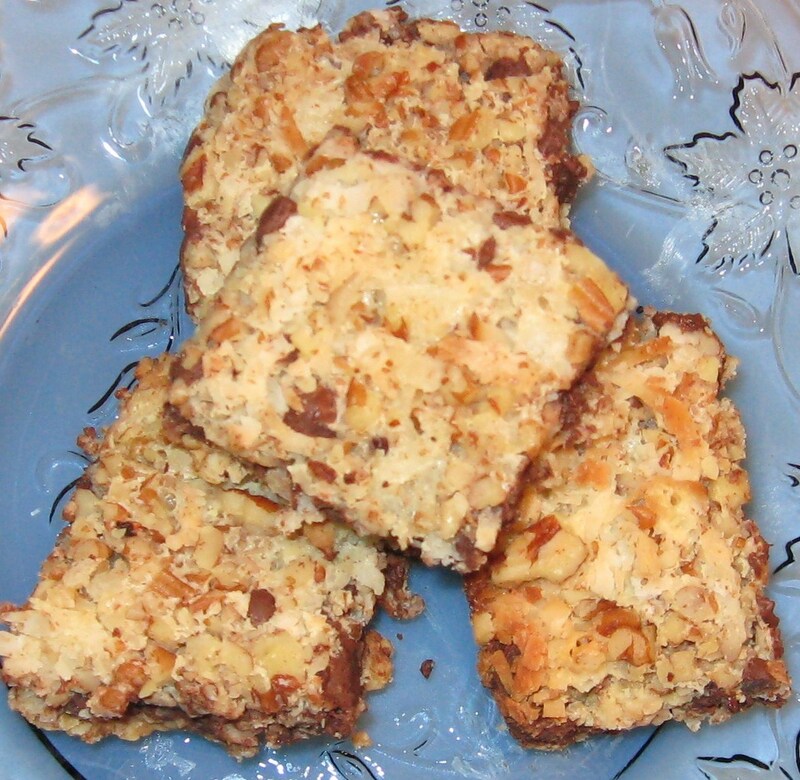 Year-round, Shirley puts the notion to rest that this is a difficult diet to follow through her advice and many delicious recipes including the one for “Magic Oat Bars” which I have a photo of and link to below. Shirley gives us a stocking full of ways for gluten-free life to be easier during the holidays. And beyond. The busy holiday season is upon us, a time when many get overwhelmed with all they have to do. Eating gluten-free can be time consuming due to the food prep. How can we make gluten-free life easier when life is hectic? I’ve always focused on simple dishes and recipes versus lots of packaged stuff and when I went gluten free, after a “stutter step” or two of “what on earth am I going to eat?” I just stuck with that approach. I’ve kept the focus on real food and recipes that are naturally gluten free, a few mainstream “ready-to-go” products, and a very few gluten-free specialty products. That’s the essence of my gfe approach. It’s been logical and a lifesaver for me and my family, and so many others have written to tell me that this approach has been the ideal choice for them as well. Looking through your list of 50+ Meals That Are GFE, I see many that could be made ahead. Do you have any tips for making food ahead? It’s always been three of us, and now only two of us, so making food ahead in general has always seemed to result in more waste in my family. But I do like to freeze components for meals. For example, I’ll brown ground meat (e.g., beef, venison, turkey) in one-pound quantities and use later for chili, tacos, etc. I also will save cooked turkey and chicken (such as grilled or baked chicken breasts that I’ve frozen on a baking sheet) in freezer containers for quicker meals/salads. Leftover rice goes in the freezer in two-cup containers. I also freeze pumpkin puree and grated zucchini in the same manner. The meals and recipes come together very quickly with some of the most time-consuming steps out of the way. During the holiday season, it seems there’s a reason to celebrate around every corner – many where mystery foods (is there or isn’t there gluten?) are the only option available. Hors d’oeuvres at parties could easily trip us up. Is there anything we can consider safe? Or should we pull out a snack we’ve brought and ignore the goodies around us? When it’s an occasion such as sit-down dinner or a potluck where we can take something, what could we take that others will enjoy and doesn’t scream gluten-free? I’d say that almost nothing that I make “screams” gluten free. That is part of my whole gfe approach. I want the flavors and textures to be the same or better. I go for traditional recipes, but often make them flourless and crustless. More recently, I’ve been making my recipes healthier by using low-glycemic coconut sugar and super healthy coconut oil versus butter. Nobody is any the wiser because the recipes taste just as good or better. I have lots of meal ideas, treat ideas, etc. in my gfe tip sheets. Grabbing a quick bite to eat while we’re out, whether shopping or watching a child’s Christmas play, often isn’t an option. Should we eat before we leave home, check on restaurants in the area in advance, make do with snacks? None of the above? Again, I’m probably an anomaly in this area. I just go with the flow. I choose not to panic because I’m gluten free and just consider all the naturally gluten-free options available. If I were going to a child’s Christmas play in my gluten-full days, I would have eaten something before I attended such an event, so the same holds true now. There are usually no food options at such events and they tend to run longer than anticipated. I was never one to stop to eat while shopping so I tend to do the same as before, either eating something before I leave or relying on a snack I’ve brought in the car. Folks get tired of me saying that I eat the apples and/or nuts, but I usually do and that’s nothing new. I love the combo for a sweet, naturally gluten-free protein boost. My gluten-full husband has always appreciated this habit of mine, too. All that said, we are creatures of habit. We tend to know where we can eat safely in an area. If my husband and I are out shopping and running errands and get seriously hungry, we just go to one of our standby spots where we know I can eat safely. I host an annual cookie exchange at my house in December. How should someone who’s a celiac or gluten intolerant respond to a friend or acquaintance who wants to bring something “safe” for them to eat? That is a much tougher situation that is best answered by that dreaded reply “It depends.” There are very few folks whose cookies I would eat. They include some family members and a very few friends, who after 8 years of seeing me be gluten free (and what happens to me when I accidentally get gluten) and hearing me talk about cross contamination, lack of knowledge, etc. have learned to feed me safely. If we all think back to when we first went gluten free and what we didn’t know and how it took some time to learn the gluten-free language, “de-contaminate” our kitchens, etc., then I think we’ll realize that the number of folks who can feed us safely is a very small one. So for most folks, I’d say something to the effect of “Thanks, but that’s okay. I realize that you are not gluten free and even a little bit of gluten in your kitchen can cause me to be very ill. I really appreciate the thought though!” It can be a touchy situation, but it can be done correctly. Of course, people who truly care about you will not be offended if you pass up their food, because those people want you to stay safe and well. Each of us comes to our gluten-free life from different backgrounds and with different lifestyles. We may enjoy cooking. Or not. We may have kids, be a couple or single. We may work in a job outside the home or have a home business. How can we find our own gluten-free rhythm of life where it all makes sense and works? Well, first and foremost, I’ll give the advice I give “newbies” all the time. Stop and examine all the foods, recipes, and meals that you are eating and enjoying right now. See which ones are naturally gluten free and which recipes/meals just need a little bit of tweaking to be gluten free. Back to the “creatures of habit” thing, we tend to eat our favorite foods and meals over and over, so once we have the gluten-free ones down pat, we can just go down that same type of path. As far as those who don’t enjoy cooking, well, I’m a big advocate of cooking. I think that perhaps many who say they don’t enjoy cooking have not had the proper exposure to cooking. Maybe they didn’t have the right teacher or no teacher. Maybe it was made too complicated for them. Maybe they were chastised for messing up the kitchen. That last situation was my case as my mom was fastidious about her clean kitchen, so I didn’t learn to cook until I was away at college and on my own. But all those things can be resolved/overcome by just getting into the kitchen and doing simple cooking. I pride myself on my gfe recipes being very easy to make and, of course, delicious. So I think these recipes can show folks that they really can cook after all, they can cook successfully, and finally, they can cook gluten free safely. Cooking empowers one on so many levels and you really know what’s going into your dishes when you are doing the cooking with real food. Oh, and it’s much more of a stress reducer than many other activities, but you have to give it a try and keep doing it until you find that rhythm that you speak of. One final note … I get more than a little annoyed when folks say that there is no time to cook. We waste A LOT of time doing things in our society today that contribute nothing to ourselves or our families. If we truly have no time to cook, we only have to drop one or two these activities to have that time. But to be clear, I don’t spend hours in the kitchen. Most of my recipes come together in about 30 minutes or less. My husband Larry (also gluten intolerant) took one bite of these cookies and got a very happy look on his face. He loved them so much that he really didn’t want to share but we still took them to a church potluck where many commented on how good they were. I made them with gluten-free quick cooking oats because that’s what I had and it worked well. Great interview. BTW, I made the Magic Oat Bars for Christmas using milk chocolate chips and walnuts. They are amazing!! Larry likes these so much that he requested them for Christmas Eve (the main celebration for his family.) I made them with semi-sweet chocolate chips and pecans.